Spencer Lacy and Haley Mills took out the destruction derby that was the SUP Cross, while Gillian Gibree was the quickest in the women’s sprints. Over in the men’s sprints Kai Lenny showed he’s one of those annoyingly “good-at-freakin-everything” kind of athletes, taking out the downriver sprint ahead of Mike Tavares. After reading Kai’s summary of the event, it seems the wunderkind is pretty stoked with this kind of SUP racing format. 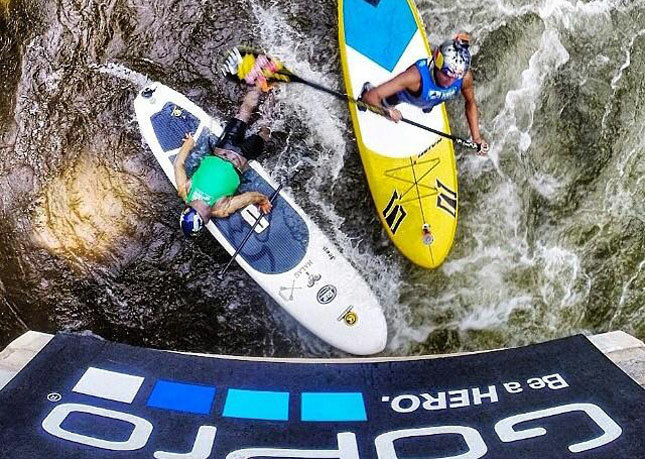 Though actually it sounds like Dan Gavere had the fastest time in the sprints but was DQ’d on a technicality, so look out for him at Payette River Games next week. Along with Dan, we’ll also be seeing Kai, Mike, Haley, Gillian and plenty of other athletes from the Mountain Games jump back in the river in Idaho next week. They’ll join the likes of Travis Grant, Jamie Mitchell and Candice Appleby to battle it out for the record $50,000 prize purse.